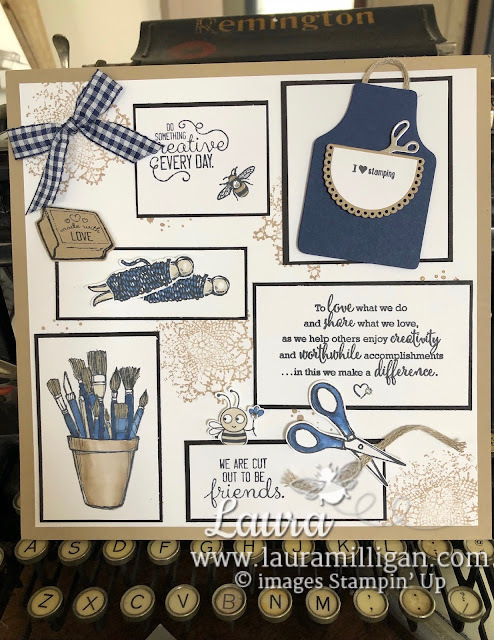 I'm just back from Orlando and Onstage Live where we celebrated Stampin' Up's 30th Anniversary! What an amazing event it was!!! There were over 7,000 demonstrators there from all over the world! My team! Here's a photo of my team members that were at the event. We had matching team T Shirts with our team name - "We'd Rather "BEE" Stampin' on the front! They were so cute!!! These are some talented and creative people and I'm thankful for each and every one of them! For several of them, this was the first time they had attended a Stampin' Up! event and I know it won't be their last!!! This next photo is Alycia and her two Aunts that are on our team! How fun for them to attend Onstage together! Alycia makes beautiful cut out cookies and made these for our team - she also shared them with others that she met at Onstage. I know she gave one to our CEO Sara Douglass! Aren't they adorable? And they were delicious!!!! When we checked in, we were given a beautiful box that held a stamp set, pens, cute notepads and more. We received ribbons for our achievements this past year - I was recognized for Sales, Recruiting, Leadership and for earning the Incentive Trip to the Greek Isles. I ranked 34th in Sales for the United States ( not sure how many US demonstrators we have, but it's close to 40,000). I ranked 59th Overall in the United States, and I ranked 114th Globally amongst over 50,000 demonstrators! That seems crazy!! I'm honored and blessed! A huge thank you to my team and all of you, my wonderful customers for supporting my business! They say if you love what you do, you never work a day in your life - well that perfectly describes me and my Stampin' Up! business! I was also recognized as a member of our new Demontrator Councils. This is the first year we have had these councils and I am honored to have been selected to serve. I had to apply for this position and had an interview - it's been a long time since I have had an interview - probably over 30 years! I became a demonstrator in 2000. Little did I know then how much this would change my life! Here's a closer look at the bees! I gave a Sampler to my team members at Onstage, and a few close friends - they will go in a frame to display in their crafting/stamping spaces! I used an assortment of stamp sets and papers and ribbons to make these. 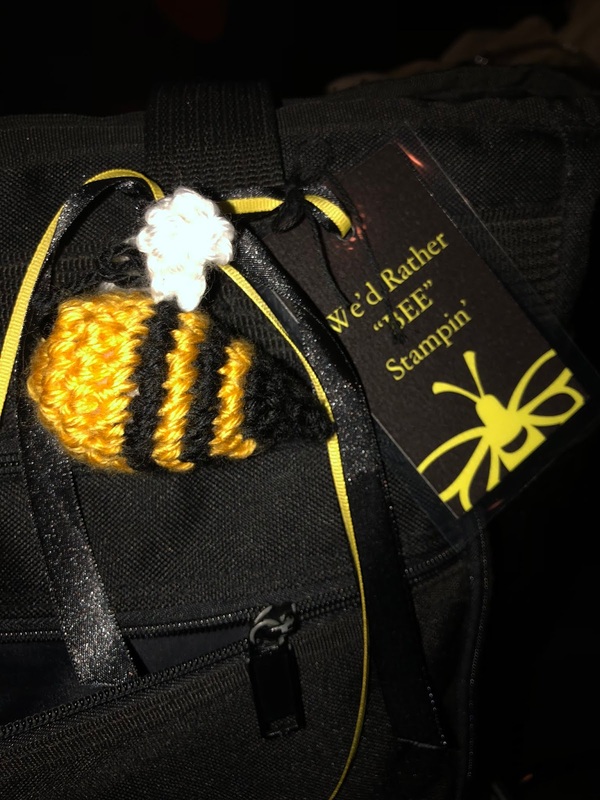 I wanted to add a bee to go along with me team name, and this little bee from the Bee Thankful stamp set seemed to fit in well!! The big news at convention is that as of January when our Occasions Catalog comes out, we will no longer carry Wood Mount stamps (except for the large background stamps.) Instead we will carry Cling Mount stamps (new!!) and photopolymer. We got to use the Cling stamps in several of our make and takes and you will love them!!!!! More on them later!! That's it for now! Come back tomorrow - I'll be hopping with my Stamper's Dozen blog hop friends! Have a great day!